2016 Jeep Patriot Sport - Sport trim. McGee 136 Point Certified Inspection. WAS $13,907, EPA 26 MPG Hwy/22 MPG City! iPod/MP3 Input, Satellite Radio, CD Player, Bluetooth, TRANSMISSION: CONTINUOUSLY VARIABLE T. POWER VALUE GROUP, AIR CONDITIONING SEE MORE! POWER VALUE GROUP Body Color Door Handles, Illuminated Entry, Speed Sensitive Power Locks, Keyless Entry, Automatic Headlamps, Power Heated Fold-Away Mirrors, Power Driver 1-Touch Windows, Body Color Liftgate Applique, AIR CONDITIONING, TRANSMISSION: CONTINUOUSLY VARIABLE TRANSAXLE II Autostick Automatic Transmission, Tip Start, ENGINE: 2.0L I4 DOHC 16V DUAL VVT (STD). 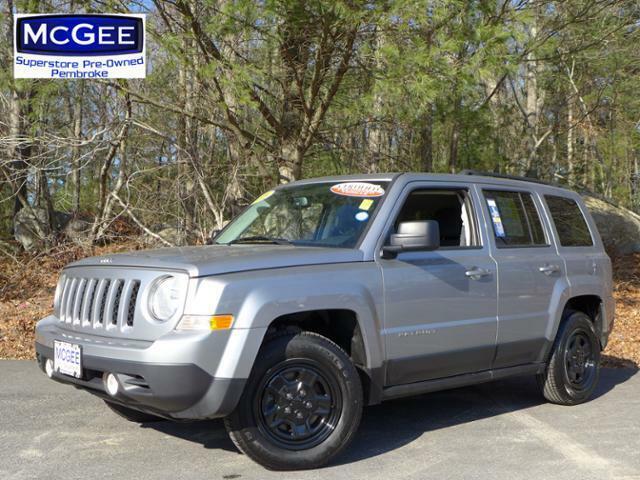 Jeep Sport with Billet Silver Metallic Clearcoat exterior and Dark Slate Gray interior features a 4 Cylinder Engine with 158 HP at 6400 RPM*. Clean Autocheck Report! Autocheck 1 Owner, Remainder of Drivetrain Warranty. Edmunds.com explains The Patriot's primary gauges make a good first impression with their large, easy-to-read font, and the straightforward, generally ergonomic controls are consistent with Jeep's no-nonsense heritage.. Great Gas Mileage: 26 MPG Hwy.